PRINCETON-BY-THE-SEA >> Reflecting optimism about this year’s abundance of chinook salmon, fishing industry regulators on Wednesday approved the longest commercial season in more than a decade. But the state’s record drought has darkened the long-term outlook for one of California’s most valuable fish. The San Francisco region’s 2015 season will total 139 days between May 1 and Sept. 30, the Pacific Fisheries Management Council decided near the end of a weeklong conference in Rohnert Park. The council also voted to allow 11 days of fishing off Point Reyes National Seashore in October, when the fall-run chinook pass under the Golden Gate Bridge to spawn in the Sacramento River system. But as California’s historic drought enters its fourth year, chinook salmon are under duress. Dry winters take a big toll on the fish, also known as king salmon, which need plenty of cold water to make their way out to sea as juveniles and return to lay eggs as adults. The salmon have for many years had to compete with Central Valley agriculture for water. It’s a David vs. Goliath battle. 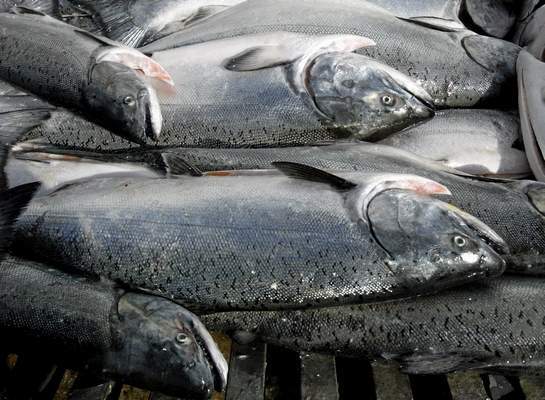 California chinook salmon fishermen unloaded their catch for nearly $23 million in 2013. Central Valley farmers generate billions of dollars in sales every year. But the fight for water will only get fiercer as the drought persists. Jon Rosenfield, conservation biologist for the Bay Institute, said winter- and spring-run chinook — smaller salmon populations that are protected under endangered species laws — will likely die off in coming years unless state and federal water managers allocate more water to the Sacramento River and its tributaries. “We are on a countdown to extinction,” Rosenfield said. Meanwhile, the fall-run chinook’s numbers could plummet to the point that commercial fishermen are barred from catching them, Rosenfield said. State and federal hatchery programs have enabled the fall spawning season to persist. Fishermen and the California Department of Fish and Wildlife have bolstered those initiatives in recent years with a variety of new projects to truck or float juvenile salmon from inland hatcheries to the bay and ocean. Transporting the smolts protects them from almost certain death in the increasingly tepid and shallow Sacramento channel. Marshall said the survival of the fall-run chinook and the industry the fish supports, will depend on the willingness of the state and other stakeholders to devote more funding to these extraordinary measures.